And this is Oracle, I always wonder if it test its product before they release them. I am using 11.1.1.5 version. According to my understand, if there is no unreferenced AM instance, system will passivate and activate AM. If I set the Maximum Pool Size and Referenced Pool Size to a very very large value, the data control can always use the same AM for every HTTP request and no passivation is needed. The reason why I do not set the size to a very large value is that system will request operating system to allocate more memory and memory swap will occur. Swap is slower than passivation and that is the reason why we need to adjust the value. Right? You should set referenced pool size to estimated number of concurrent users. You assume that one user session will use only one instance of the AM, so set referenced pool size to estimated no of concurrent user. Right? No matter the memory size of the server? How about the Maximum Pool Size? Yes, this is how is supposed to be. Maximum pool size is usually irrelevant, it can be any high number. Besides AM configuration, do you suggest developer to create a shared AM which contains all the LOV of the system? If yes, any benefit besides lessen data source connection? Say memory consumption? Is the improvement significant? There is no need to include lov into am at all, lov are consumed from vo. Usually i dont see a need for shared am, as it is useless with adf shared libs. I am using version 11.1.1.5 and trying to tune the performance. According to the suggestion from the site ( http://www.oracle.com/technetwork/developer-tools/adf/learnmore/87-lov-using-shared-am-444769.pdf), they suggest to create a shared AM to minimize the data access from database. Do you suggest system to follow? If yes, will it improve the memory, database connection in version 11.1.1.5? For java class type DataControl/AM, does the system use the same java instance over several HTTP requests? If not, can I assume that the java instances are LOGICALLY the same? say the value of java attributes can carry forward to the next HTTP request. Any relationship between Referenced Pool Size, Minimum Available Size and Maximum Available Size? Say Minimum < Referenced Pool Size < Maximum ? If yes, any suggestion on the min and max value if referenced pool size is 1000? It depends, I would need to test your application to answer properly. Referenced pool size should be set to no of concurrent user. What do you mean concurrent user? Assume the application has only one AM and 1000 users login the system . Around only 5% of users will submit the request at a particular moment. Should the referenced pool size be 1000? or 50? 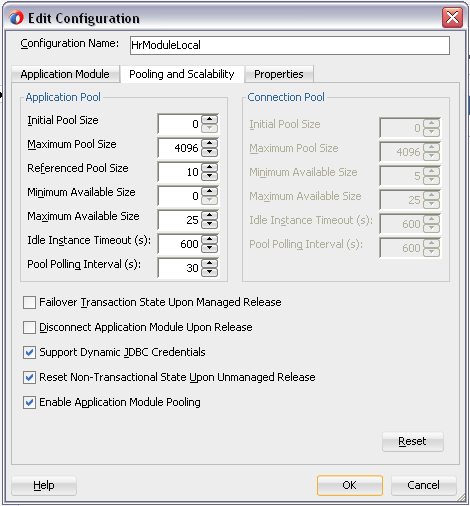 In most application, it is no need to set "jbo.doconnectionpooling=true". Is it correct? If we set jbo.doconnectionpooling to true, ADF will release the connection immediately after the HTTP request is completed and no need to wait for any monitoring task to clean up? Concurrent users - users working at the same time. 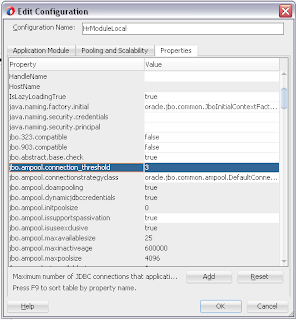 Not correct, I recommend to set "jbo.doconnectionpooling=true" almost in every application - this allows to clean statement cache in ADF and release memory. In my previous example, 1000 users login the system and submit requests to the system randomly. At a particular moment, maybe just 50 request. So concurrent user = 1000. right? No, this means 50 concurrent users. There are 1000 users using the system in my example. For example, user01 - user50 insert a record to the view object but not yet committed. Then 10 seconds later, user51 - user100 insert a record to the view object without save. The 50 AM in the pool will passivate the data of user01-50 and serve user51 - user100. Is it correct? If yes, there are 1000 users using the system and the AM will passivate frequently. It seems that setting the referenced pool size to 50, but not 1000 cannot prevent passivation. I do not why we need to set the referenced pool size to no of concurrent users, but not no of users using the system. I would need to come to your office or we could have conference call by remote to discuss it. This is quite complicate to give you precise answer through blog comment. If you are interested - send me email. Deeply appreciate your help and prompt reply. I will send to your gmail account later. Ideally, this should imply that beyond 3 datasource connections, all AM's that take a DS connection will release it when checked back into the AM pool. However, this is not happening. 1. when Disconnect App Module Upon Release is TRUE: the datasource user in v$sessions keeps increasing but the appuser count in v$session is 1 (meaning that AM's release the datasource connection as soon as they are checked-in into the AM pool). This is as expected. 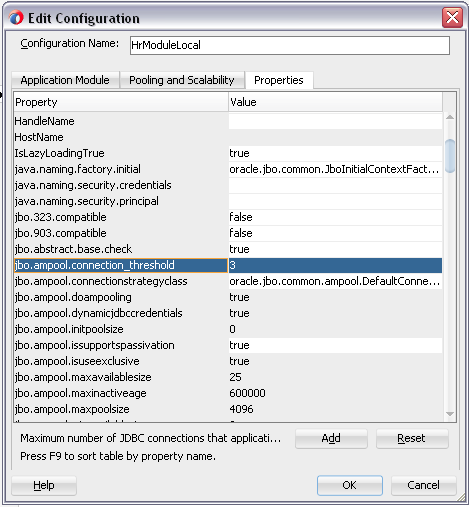 2. when Disconnect App... is FALSE, and jbo.ampool.connection_threshold is 3, the v$session counts of both datasource user and appuser keep increasing. This shows that the AM instances are not releasing the datasource connections. This is NOT as per the Developer Guide definition of this parameter (connection_threshold). Do we know what may be the actual reason of this? Can it be that this feature doesn't work with Dynamic UI tab shell?